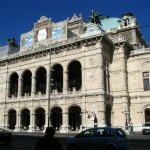 The three opera houses in Vienna are the Staatsoper, Volksoper and Theater an der Wien. The Staatsoper (the state opera house opened in 1869) enjoys an outstanding global reputation. It has the biggest budget and stars (and the best-looking building) and hosts mainly operatic productions with some ballet. Big names in opera history, like Luciano Pavarotti, Maria Callas or Enrico Caruso, all played here. Despite daily performances, it nearly always sells out, though there is a surprisingly easy way to get cheap tickets on the day of a performance. You can explore this iconic opera house in detail thanks to a Google art project. The Volksoper (opened 1898) also has its own ensemble, so can vary its schedule more frequently. It hosts opera, operettas, ballet and musicals. It also hosted the Staatsoper when that building was almost completely destroyed in WWII bombing, reopening in 1955. The Theater an der Wien tends to host short-run guest productions and only recently returned to the role of opera house, though it has a long operatic and musical history: Beethoven was once the director of music!